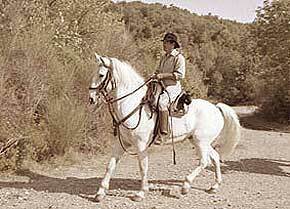 The typical working way to mount a horse in Italy is the Maremmana Mount. The Buttero guides its horse with a single hand, holding in the other "l'uncino", a typical shaped stick that helps him in the job. The horse used by the buttero belongs to the maremmana race: it is a robust horse, high to the withers over 165cm, its typical color is dark brown to black. They are extremely reliable in situations of every kind. The two types of saddles used in the Maremmana Mount belong also to the tradition: the "scafardo", of military derivation is build on a wooden saddlebow, and the more simple "bardella".